weDevs has been sponsoring WordCamps around the world for the last 5 years. To keep up with this trend and giving back to the community, we have recently sponsored WordCamp Pokhara 2018 in Nepal and will be sponsoring WordCamp Ahmedabad 2018 in India. To make things interesting and convincing more people to use WordPress, this time weDevs will be arranging a grand giveaway. 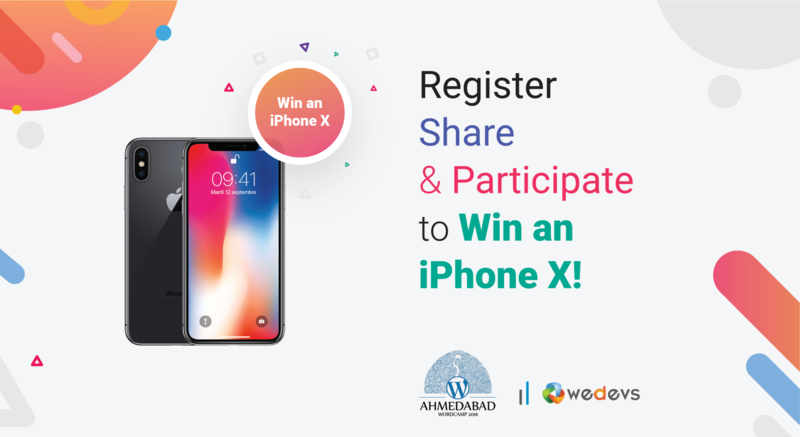 On the occasion of upcoming WordCamp Ahmedabad, we will be giving away a FREE iPhone X to a lucky winner! We all know that open source is the best thing ever. It helps millions of people everyday with their web technology related projects and work. WordPress is on the top of the list of open source software. More than 30% of world's websites are built with WordPress. This makes it the most popular CMS out there. To help the community and spreading out the word, a lot of WordCamps happen every month all around the world. This December, WordCamp Ahmedabad is happening and weDevs is proudly sponsoring this mega event. weDevs is one of the Silver Sponsor of this WordCamp. We will be there showcasing our open source contribution and also our products that help more than 70,000 people to manage their Business and websites. So, we cordially invite you to attend WordCamp Ahmadabad and also visit our stall. There is also a big surprise that will encourage you to visit us. Read through the end to learn about that! On the occasion of WordCamp Ahmedabad 2018, weDevs will be giving away a lot of swags including t-shirts, stickers, badges, wrist bands, notebooks, flyers, gift vouchers and many more! Bonus points if you have tried our products before! There will be a raffle draw between the people with most points. We will announce the winner at the closing ceremony of WordCamp Ahmedabad. Come, visit us if you are nearby and win an iPhone X while attending WordCamp Ahmedabad 2018. Can't wait to announce your name if you register! Update: The winner was selected randomly on the event and the winner's name is – Anand Thakkar. ← When It Is Not the Right Time for You to Start a Multi-vendor Marketplace?